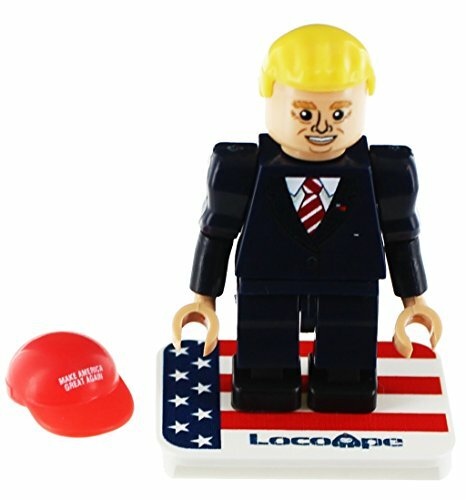 Whilst looking for unique LEGO collectables, as I do most days, I stumbled across a range of different Donald Trump mini-figures which made be chuckle. Donald Trump is fair game to be taken off in the form of LEGO, mainly because he is bold, brash, controversial and highly recongnizable with his signature red power tie and trademark mop of silly blonde/ginger hair. He is probably the most outlandish US President of all time, so to have a LEGO minifigure of him seems quite appropriate. Just to make you aware, you will NOT find these Trump Mini-figures in the official roster of LEGO characters. These minifigures are completely custom designed making them a true collectors’ item. The first one that caught my attention was the Trump LEGO Minifigure in his famous blue suit, red tie and ridiculous blonde/red hair. 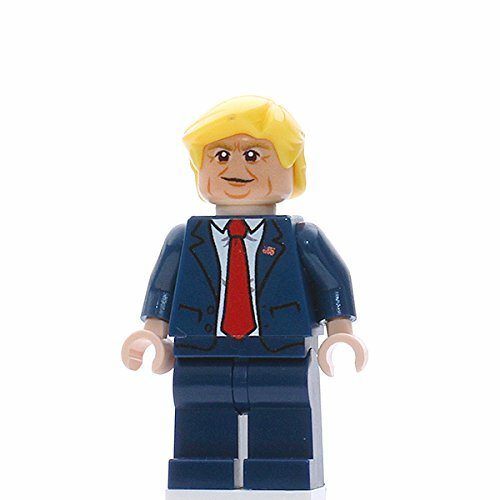 This is probably my favourite Donald Trump LEGO minifigure as the detail on the face is so much better than others that I have seen. You can see that the artist knows how to properly shade and detail facial creases and wrinkles. With Firestar Minifigures, all LEGO parts uses are brand new and are custom digitally printed onto the parts themselves. The packaging is pretty cool as well. It’s “Comic Con” in style and I know collectors will want to keep the minifigure in the box, so it’s important that they stand up on their own should they wish to be displayed on a shelf or some sort of display case. It’s 100% compatible with other official LEGO sets. Not as good in terms of facial detail than the first example of Donald Trump minifigure, but this one comes with a “Make America Great” red cap that Trump sometimes wears. The suit is a darker blue and there’s a total of 10 pieces in total. The pieces are very small, so I’d keep them away from your kids ( under 6 ). You will need to build this minifigure, and it doesn’t come in fixed display packaging, unlike the Firestar version mentioned above. Standing at a height of 1.6 inches tall, this Donald Trump ( 45th President of The United States of America ) minifigure has small gripping hands (just like the real Donald Trump), rotating forearms and bendable knees. It’s 100% compatible with other official LEGO sets. 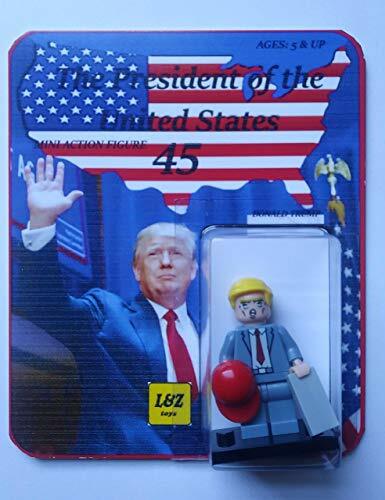 #3 – L&Z Toys Custom Card for Donald Trump Minifigure. In 3rd place is the L&Z custom Donald Trump minifigure. 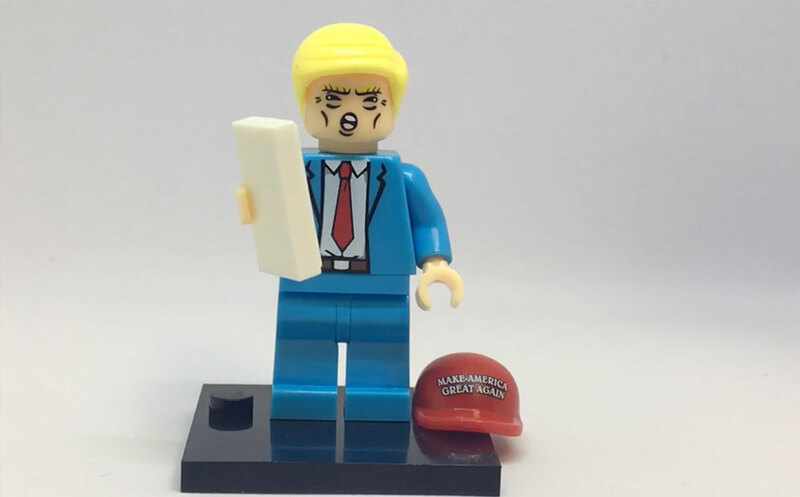 It’s not as detailed as the two versions above, but still a good addition to your Trump LEGO collection. It’s the same height as the other two, but comes in a very light blue suit and not as detailed facial features. What it has going for it is the comic con style packaging, which means that true collectors can keep their Donald Trump minifigure safe in its original box.